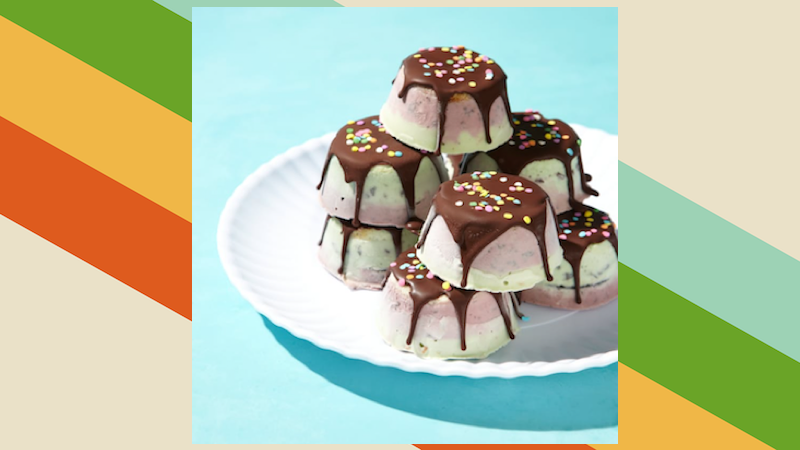 Individual ice cream cakes also makes them less messy to eat, which is helpful if you're serving these to kids. Besides cake and ice cream, you'll need a muffin tin and plastic wrap. You also have the option of a wafer cookie for an additional layer between the ice cream, and toppings like sprinkles or melted chocolate. Line each cup with plastic wrap and place a round of cake into each cup. Scoop softened ice cream as the next layer, put a wafer if you want, then add another layer of ice cream (mix flavours if you want). Freeze for at least an hour. You can store these in the freezer for up to a week.